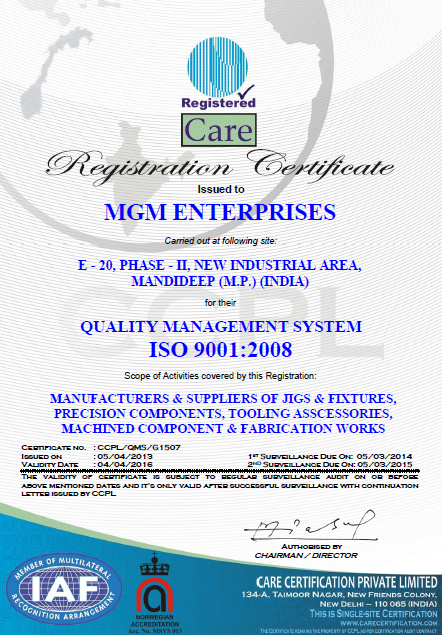 Our quality programs are based on the process approach as outlined in ISO 9001: 2008. Our quality department maintains complete records of part quality and lot traceability to raw materials. It is the policy of the industry that every reasonable effort shall be made to provide and maintain safe and healthy working conditions, equipment and system of work for all employees. It shall also be endeavour of the industry establishments to ensure that surrounding environment is not adversely affected by our activity. The prevention of accidents of accident hazards leading to personal injury of damage of equipment / Property is recognized as essential and integral part of efficient operations. Every employee shall follow safety Rules / Regulations, Operating Procedures / Safe Work Method designed to protect people and equipment from risk of injury of damage to property. The industry shall endeavour to adequately train all employees, suitably equip them and instruct them to perform their duties in a safe and effective way. Every employee shall discharge his personal responsibility and shall co-operate and actively participate in maintaining and improving standards. MGM Enterprises, it all began back in the year 1995. In a short span of time we have emerged as one of the prominent Toolroom in Central India and for featured fabrication mechanism. Success for some means reaching the top of the ladder, for others, the top of the ladder is just the beginning. At MGM we are dedicated to achieve the milestones of success as well as keeping our customer completely satisfied through our vibrant efforts.